The much anticipated rollout of small cells appears to have finally arrived. The wireless infrastructure industry has been forecasting the small cell boom for the last couple of years and while the current wave is not as big as initially anticipated, the work is rolling out, and along with it a lot of new challenges. It’s clear that business as usual (which arguably no longer works even in the macro-site context) has no place in small cell deployments. working with local municipalities to develop guidelines for deployments specific to small cell technology. In our opinion, the last issue is the most significant challenge we face at this time. On the one hand, operators have an immediate need for large-scale, efficient deployments in the rights‑of‑way. On the other hand, municipalities need to maintain the architectural and historical integrity of their communities while faced with an extraordinarily large volume of applications crossing their desks and (often) antiquated code, guidelines, and processes designed for hundred-foot towers. Given the stakes, the wireless infrastructure industry must take the lead to bridge these issues. The following table outlines these two points of views from a high level. Mobile operators need to deploy a lot of new technology quickly and at a low cost due to their saturated market space. Based on the latest technology, one of the best ways to do this is to mount small cells on utility and light poles in the right-of-way. Local officials want to make sure the latest technology being mounted on these poles is deployed in a manner that is consistent with the look and feel of their community so that their citizens (ideally speaking) can have access to bandwidth without even knowing where the rad centers are located. Many local officials are just now being exposed to small cell technology for the first time, leading to small cell approval processes being shoehorned into macro-site build processes. As carriers and municipalities work through newer deployment models, frustrations have arisen on both sides. 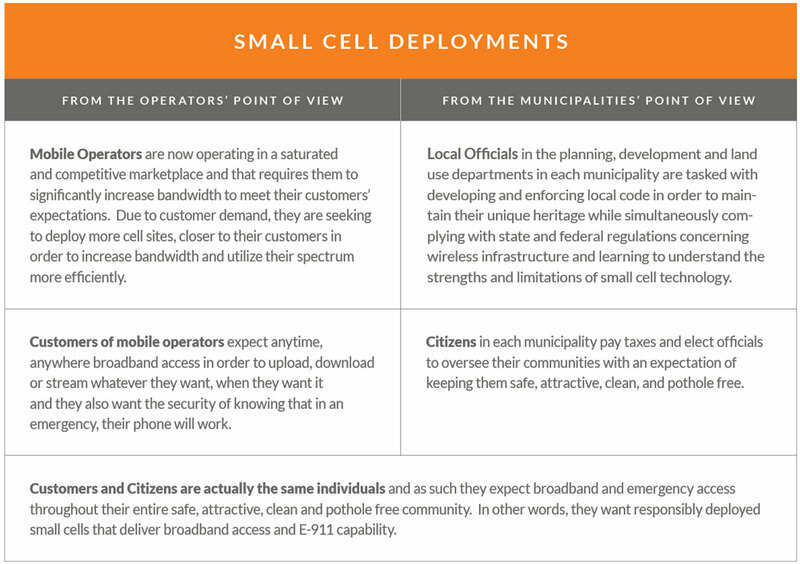 However, at the end of the day, mobile operators and local officials both just want to meet their customer’s/citizen’s expectations. Is it possible to satisfy the consumer and the citizen in each of us? At Md7, we believe the answer is yes – small cells can be deployed and even accelerated in a responsible manner. The following are the top-five tips that the Land Use Team at Md7 has generally found not only satisfy the local officials, but also actually accelerate deployments for our customers. 1. Treat people with respect. At Md7, “respect for the individual” is one of our six core values. Simply put, treat each person as you would want to be treated. If we treat each person we encounter as we want to be treated (even if they are opposing us on an issue), life is just more enjoyable. 2. Approach your municipality early. And often. For most jurisdictions, small cells are part of a new world. Therefore, as soon as a project is in-house (and subject to client consent), approach the jurisdiction with the project. The more visual materials available, the better. Getting the planning office involved early on allows for mutually agreed upon designs and government buy off. Bring in updated materials as they become available to continue the earlier dialogue and to help avoid expensive and time-consuming design revisions. 3. Aesthetics matter. The look of the final constructed project matters a lot. It matters to the municipalities, it matters to the citizens, and it matters to every future deployment. An aesthetically displeasing build leads to community distrust. Keep the wires tight and equipment small. Remember, this may be someone’s home. The look of the deployment must fit the look of the neighborhood. 4. Take the long term approach. If you push an approval request through in an irresponsible manner you may, in some circumstances, actually get on-air more quickly. Or, more often than not, you may actually delay your deployment through multiple rejections and resubmissions. Not to mention, you will damage relationships with the key decision makers within a community and often scorch the earth for future deployments. 5. If the municipal code or local guidelines are out of date, work with the municipality to update them. Md7 has actually done this in a few occasions. Many municipalities don’t have the time or resources to draft new code or guidelines for a technology they have never seen. By taking the time to educate them on the new technology and even giving them examples of code or guidelines from other municipalities, the goodwill you create more than offsets the time and cost to your projects on the front end. The wireless consumer is also a citizen. The people who earn a living developing wireless infrastructure ultimately serve the same individuals that local government officials represent. The Land Use Team at Md7 has found that practices such as these not only smooth out the entitlement process, but actually accelerate deployments – particularly in the rapidly developing arena of outdoor small cells.